Murder Threats Provoked by FAKE NEWS? Violent Acts advocated against young Christians on Twitter, Social Media Platforms | Public Advocate of the U.S. 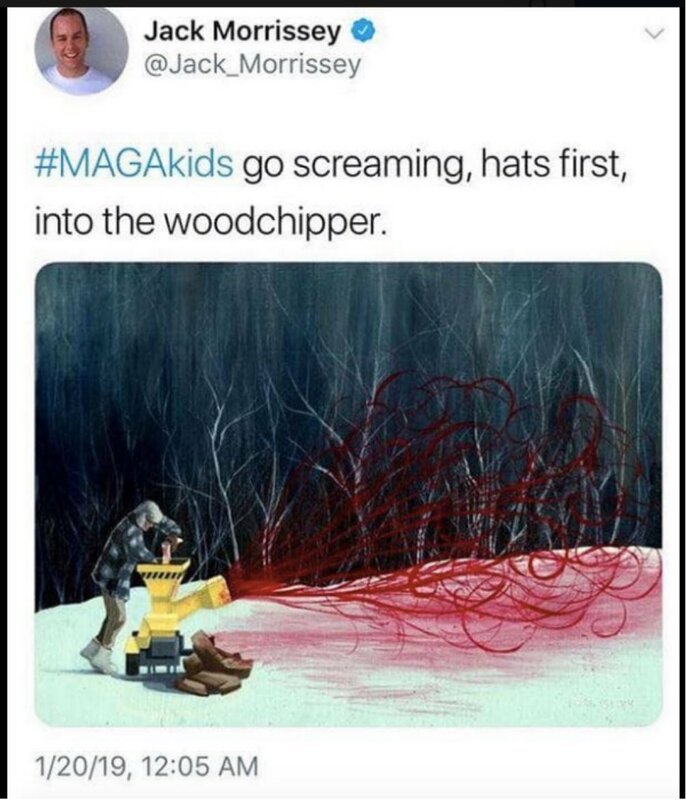 The Hollywood producer of "Beauty and the Beast tweets out photos or "memes" of mass murdering young Christians wearing "Make America Great Again" hats this past weekend in response to allegations that the young men are "smirking" at a chanting Indian banging a drum in their face as portrayed in videos posted on twitter. "Mass murder is being advocated by the thousands as liberals type "kill them all" and more explcit threats pouring in by the thousands directly to the accounts, phone numbers, of any one connected to the Covington Catholic High School that students attending a March for Life rally in Washington have. All because they -- all of them-- simply and respectfully stood and were subjected to the public abuse of a leftist freak for attempted to provoke them to react. The young man who became the sole focus of the extremist agitator just smiled and remained unprovoked. The mass media accepted as truth a ten second excerpt or photo caption a complete lie, libel and slander and broadcast to the world this lie, libel and slander., " said Eugene Delgaudio president of Public Advocate. "The confusion and misinterpretation has caused thousands of violent sadistic on the record threats, and worse. The mass media has, by their irresponsible actions, portrayed falsely these innocent Christian souls who merely stood and watched a disgusting abuse of their genuine victimization by perverted adults who deliberately set out to first, provoke and cause a negative reaction, and then 2nd, failing that, go on a false portrayal and libel campaign which resulted in 3. calls for "mass murder" to further ochestrate violence against Christians nationwide, " said Delgaudio. Public Advocate has long warned against the terrible persecution of Christians in America. The evidence of persecution against Christians simply for being and acting Christian-- open, tolerant, patient and trusting in God's grace-- which is what these Covington High School young men exhibited is now the focus of massive hatred, death threats, harrassment, sabatoge and just plain evil treatment by so-called normal Americans who are largely manipulated into this behavior by anti-Christian agitators who promote the destruction of our values, our symbols and now even the human beings who just passively accept abuse publicly, " says Eugene Delgaudio, president of Public Advocate.